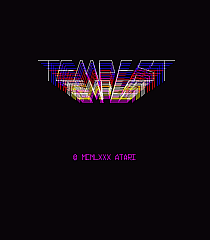 One of Atari's trademark vector games form their early arcade days, Tempest is a frenetic, busy space shooting game. You control a gun located around the outer egde of a playfield located in space. The playing area is broken up into segments, all viewed from above in perspective. Aliens come at you from the inner edges of the playfield and move outward towards you and your mission is to kill all aliens in order to advance to the next stage. Your ship can move from one segment to the adjacent one. 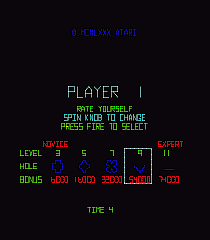 Control is by way of a spinner on the original arcade machine, meaning it's more tricky to make careful movements with a mouse or keyboard. As your ship navigates the segments of the playfield, you must shoot or avoid any enemies and shots which come towards you. 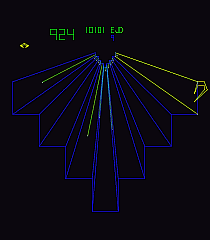 Some aliens move up the playfield and when they reach the level of your ship, they begin to travel from one segment to another and contact with them is fatal. These are the more difficult of your adversaries to destroy. Once on each stage you may make use of the Super Zapper weapon at your disposal. This weapon destroys all enemies on screen and should be used carefully, as it can only be recharged during the journey after you complete a stage and are moving on to the next. As the game progresses, your adversaries become more vicious and intelligent, as well as a lot more frequent. This makes for a very hectic game, likely to leave you sweating between levels. Shooting an alien or missile: 150 points. Be careful when you use the Super Zapper, especially on later stages, as what you often think is a tricky situation can later become a lot more dangerous. Try to maximise the number of enemies you destroy when you fire it, as you should remember that more will of course be coming at you immediately after.